The new router sports 802.11ac and 802.11ad, a built-in Plex server, 10Gbps networking, and bonded gigabit Ethernet. Netgear’s new Nighthawk X10 AD7200 Smart WiFi Router has features designed for the present and ready for the future—and a price tag to match. For a suggested $500 street price, the router packs in dozens of high-end Wi-Fi and networking features, including both 802.11ac and 802.11ad wireless, a 10Gbps port for network-attached storage, and the ability to bond two 1Gbps ethernet ports together. Netgear says the router will ship before the end of October. The company threw in everything and the kitchen sink in this model, which is aimed at the high-end home user, despite its cost. As with some competing routers, like Google’s OnHub series, the Nighthawk X10 aims to be the only router needed, even in a large house with many people competing for high-speed usage, such as for gaming and 4K video streaming. It also acts as a media server, backup server (Windows only), networked and remote USB hub, and Internet file server. 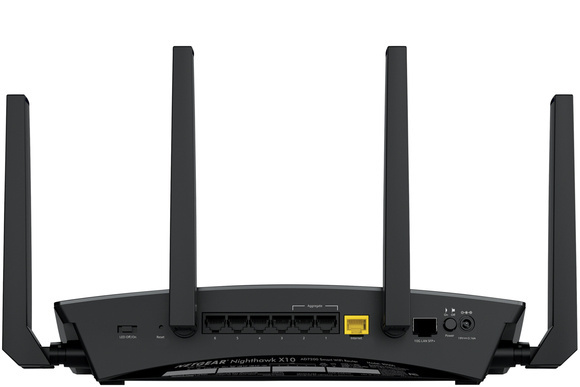 The router incldues two Wi-Fi standards: 802.11ac, which is well known, widely deployed as a wireless local area network (WLAN), and compatible with practically every computer and mobile device sold; and 802.11ad, a long-in-development, super-high-speed, short-range or Personal Area Network (PAN) standard. 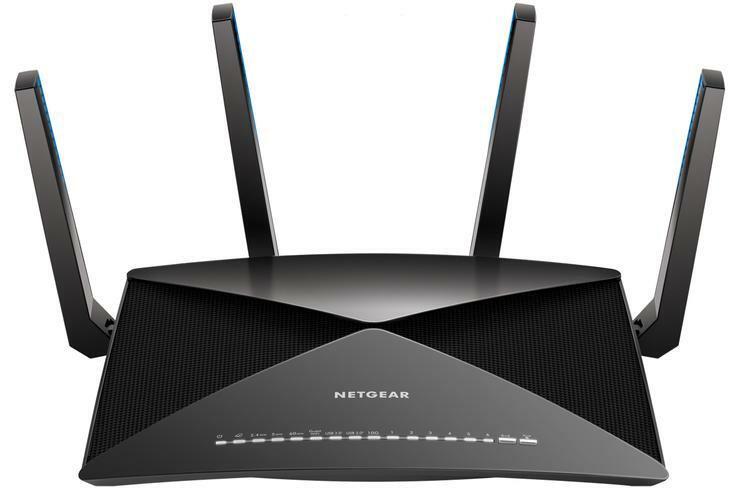 Netgear offers some of the most robust 802.11ac support on the market with what’s known as 4x4:4—that’s four receiving and four transmitting antennas with four separate spatial streams, each of which can carry the maximum raw data in the 2.4 and 5 gigahertz (GHz) radio bands. That’s 800Mbps for 2.4GHz and 1733Mbps for 5GHz in ideal circumstances. The 5GHz band can use substantially larger channels than 2.4GHz, accounting for the difference. Netgear says it put the Wi-Fi amplifiers in the tips of the antennas for better performance, but we’ll have to see whether that’s an advantage in real-world testing. Three firsts in a consumer router: An onboard Plex Media Server, dual gigabit port aggregation, and a 10Gb fiber port for network-attached storage. The 802.11ac includes both MU-MIMO and beamforming. The former allows the router to communicate simultaneously with multiple devices, and the latter works in concert with an increasing number of Wi-Fi adapters to steer signals more precisely, improving range and throughput. Its 802.11ad support is just ahead of the current goalposts. A few laptops feature the technology, which Netgear says can move data at up to 4.6Gbps. But drivers aren’t yet built into operating systems, and the tech isn’t in consumer hardware, like VR headsets, 4K TVs, and streaming-media devices. Because the standard is settled, however, this router should be ready to go as equipped hardware ships. On the software side, the Nighthawk X10 includes a Plex server, which can access and serve media stored on any USB-attached drives, including live transcoding aided by a powerful 1.7GHz quad-core processor. Because it supports DLNA, you can browse and view from a TV set or game console. The router includes a three-month Plex Pass subscription, normally $5 a month. The Plex server allows remote Internet access, too. The Netgear router supports two kinds of backup as well. Data stored on attached hard drives can be copied to Amazon Drive, while Windows machines that use the network can use router-attached drives for local backup. USB drives and printers attached via two USB 3.0 ports can be reached over the Internet, too, using a Netgear-provided cloud conduit that has no associated fees. Macs and iOS devices can access connected printers via AirPrint support. Support for the 802.11ad standard could benefit VR applications, but the industry isn't there yet. The Nighthawk X10’s final bit of kitchen plumbing comes from its ethernet options. 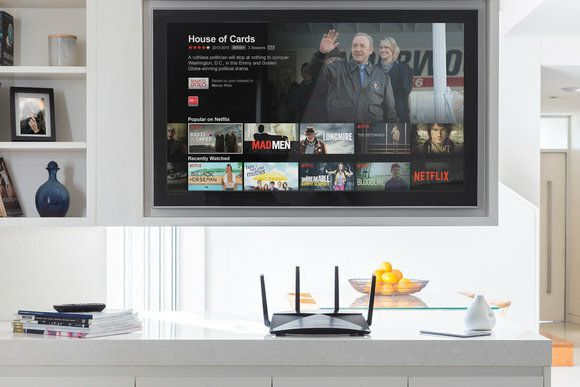 The router has as six-port gigabit ethernet switch for LAN connections, but with two bonuses for network-attached storage (NAS) devices. It can connect to a NAS with two gigabit ports and bond or aggregate 2Gbps of throughput. And it includes a 10Gbps SFP+ port for NAS units that can handle that. Finally, the router has a physical switch to turn its LEDs on and off. If it’s used in a living room or media room, it’s a huge advantage to turn off those flickering status lights that distract from watching a movie. Is it worth dropping $500 on a router when many of its features can be found in devices from $100 to $300? If you’re trying to improve coverage, reduce fuss, and consolidate services, maybe. The Nighthawk X10 comes with plenty of current value for someone without one of the newest 802.11ac routers, who have trouble reaching all corners of their house or keeping up the streaming speed necessary for media and files transfers. But it should also increase in utility over time as you upgrade mobile devices and laptops, which then are better able to take advantage of the best throughput and range that 802.11ac can manage. As 802.11d devices hit the market, the router will immediately take advantage of them, too. Having a Plex server built in and best-in-class NAS networking support for media servers you may already have could push you over the top as an all-in-one replacement of different pieces of hardware or a significant upgrade in the middle of your home media system.